For a third year running, rOpenSci is excited to announce another R unconference in March 2016 at GitHub's headquarters in San Francisco. We're organizing this event to bring together scientists, developers, and open data enthusiasts from academia, industry, government, and non-profit to get together for a few days and hack on various projects. Past projects have related to open data, data visualization, data publication and open science using R. To ensure a safe, enjoyable, and friendly experience for everyone who participates, we have a code of conduct. We are assembling an exciting team of developers and enthusiasts representing academia, industry, government, and various open source projects. We'll be back at GitHub's HQ in SOMA. 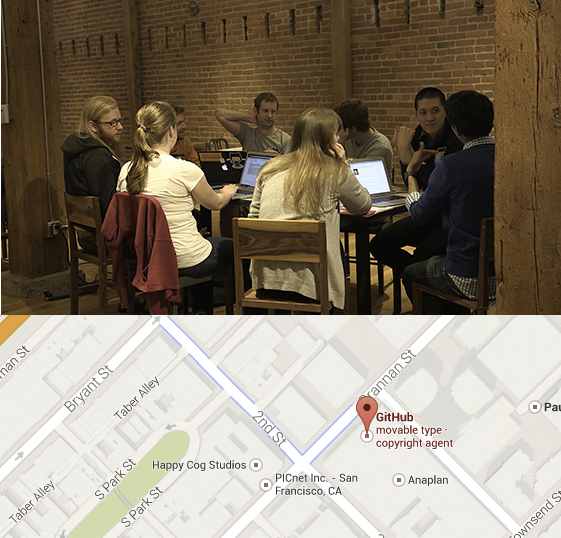 GitHub's space is perfect for hacking away and offers plenty of space to break out into small groups. All unconference ideas will begin as GitHub issues on the unconf repo in the weeks before the event. However, the actual schedule will not be decided until the morning of the 31st. You can see some of the projects proposed for last year's event. The schedule will be updated here once ready. Contact info at ropensci org for more information about the event. This page is available at this repo. Corrections, changes, and suggestions for improvement are welcome as pull requests.